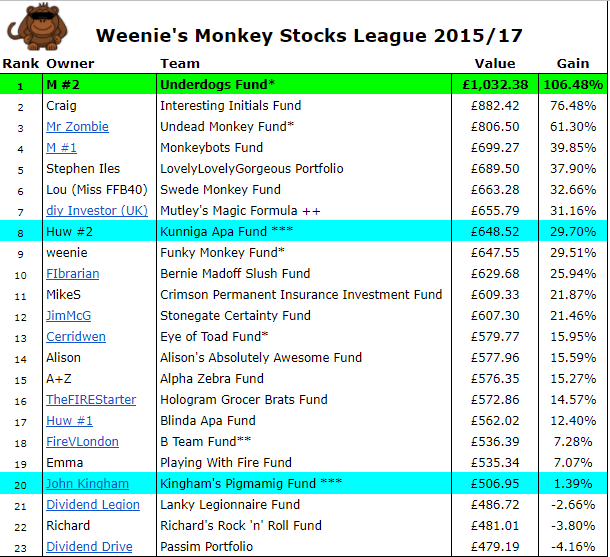 Yes, it’s been (just over) a year since I announced the winner of my Monkey Stocks League Challenge and as promised, I bring you the ‘what happened next’ update. Not my idea originally, but here’s how I came up with the idea of running my own Monkey Stocks League Challenge. The majority of the £500 portfolios lining up in September 2015 were made up of stocks/shares (from FTSE 350) which were randomly picked out of a hat. A few daft brave souls followed me in purchasing their random stocks for real! The league also had a couple of portfolios chosen by experts (John K and Huw) and of course, we had M’s infamous portfolio, based on the Dogs of the FTSE strategy and which was the runaway winner of the league. Wow, the Underdogs Fund would have doubled your money if you’d kept all the shares for another year! But check out the big gains made in many of the other portfolios – buy and hold for another year strategy looks to have paid off in a big way. 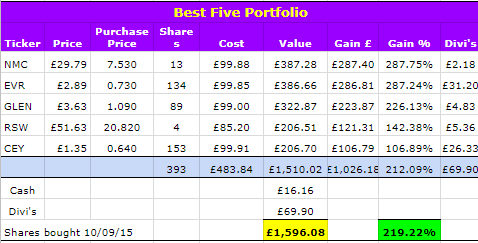 After one year, only 8 portfolios made gains of >10% and there were 10 portfolios showing losses. After two years, 17 portfolios made gains of >10% (12 of them made gains >20%) and there were only 3 portfolios showing very small losses. One portfolio of note is the LovelyLovelyGorgeous Portfolio which a year ago, was bottom of the class, showing a loss of 19%. Another year on, it’s in 5th spot, showing a gain of nearly 38% – wonder if Stephen had purchased these for real whether he would have cut his losses or hung on for the turnaround? Surprisingly plummeting down the table was John K’s Pigmamig Fund which finished a creditable 10th place after one year but a year later, ended up down in 20th place. John’s portfolio scored the highest total dividend paid last year but the accolade after two years goes to Jim’s Stonegate Certainty Fund, which has provided a 22% dividend yield! Mention must be made of diy’s Mutley’s Magic Formula fund which continued to maintain its steady process and remained in the top 10. This fund was based on Vanguard’s 60% LifeStrategy Fund, ending up with a gain of 31%. Definitely one for the passive investors! Of course, as before, in no way am I recommending that randomly selecting stocks is a viable investing strategy! Or you could get something in between and according to the experiment, that doesn’t look too bad, with the average gain being 26% over 2 years. Although M’s Dogs strategy proved superior in this experiment, it’s hard to ignore the numerous randomly selected portfolios which bagged some very decent gains. Of course, we have seen the FTSE breaking records etc – wrong time to run the experiment or the right time? What would happen in a stock market crash? As with one year, two years isn’t really long enough for any real analysis but this experiment perhaps shows that just buying and holding (and accumulating the dividends) can be a decent strategy. I should really do one last update so I can get the 3-year measurement. Let me think about it, as I’ll need to make sure I keep the spreadsheet going and keep on top of all the dividends (have to admit I found it rather tedious!). Hopefully, I will find the time to update it all. This entry was posted in Monkey, Portfolio, Shares by weenie. Bookmark the permalink. Great work Weenie, really interesting to see how this is faring, and a nice reminder of meeting everyone on that day in York. My Stonegate Certainty fund seems to be cantering nicely for a last dash to the finishing line but, of course, I’m in it for the long term. Cheers Jim and yes, updating this was a nice reminder of the day out in York meeting you and all the others! Thanks for keeping this running weenie. Mutley has slipped back a couple of places in the wacky race but I am sure he has a cunning plan.. [wheezy snigger behind paw]…to make sure the Mean Machine wins the race! Thanks DIY – I think Mutley’s doing a good job of advertising the VLS60 – it’s possible that he could end up top dog but we’ll see! Glad you found it interesting, WDYR! I’d forgotten you ran this, Weenie. The funds and your analysis provide an easy to understand snapshot of how markets work. I put myself in the shoes of some of them and asked – how would I feel if my place slipped by 10 in the table? Or my returns went from double-figures to single or negative? This is a better thought exercise than the one I did for our investor policy statement, because it’s based on real-life returns. I understand it’s a pain in the proverbial, but I’d find another year valuable. Especially if there did turn out to be significant changes to market conditions over that time. Or on the positive side, would you sell while you’ve made some decent gains to pocket some profits? Decisions, decisions! Don’t worry, Mrs ETT – I think I will do at least one more update on this because I too would like to see how it all pans out. Do you have an article on how the Dog of Index strategy works?? Looks interesting! 14.5% for your portfolio, TFS – not bad really!